There is no bigger networking conference, in my opinion, than SXSWedu. It’s a three-day conference of workshops, panels and speakers. But what it’s really about is the breakfast meeting, followed by coffee, then lunch and then an afternoon meeting. And then the real networking begins at evening parties. This really was my schedule at the most recent SXSWedu. And it’s exhausting and exhilarating. SXSWedu is such a great place to network is because it’s well attended by larger companies who are looking to learn more about the ed-tech startup community. But, you can’t just arrive and expect to get meetings. I didn’t know that the first year I attended three years ago. I thought I would come across interesting partners and share a cup of coffee after a stimulating panel. But I found that the most valuable contacts didn’t attend the panels–they came with their dance cards already full of meetings. Sure there were opportunities to meet district leaders and company brass at the nighttime parties, but you needed an invitation. No one told me that, so I was left scrambling for last minute party invitations. I was the wallflower of the SXSWedu networking dance. The next year, I was prepared. I filled my dance card with 30-minute coffee meetings, lunches off site, and plenty of coveted cocktail party invitations. Almost all of the meetingd were at my request and required a lot of follow-up afterwards. The networking put me in touch with district leaders and companies I already had relationships with, so it helped moved forward deals or relationships. But it didn’t open new doors. This year, Listenwise was running two panels. In one, I presented with teacher Michael Godsey, and Emily Donahue, a news leader from KUT in Austin. 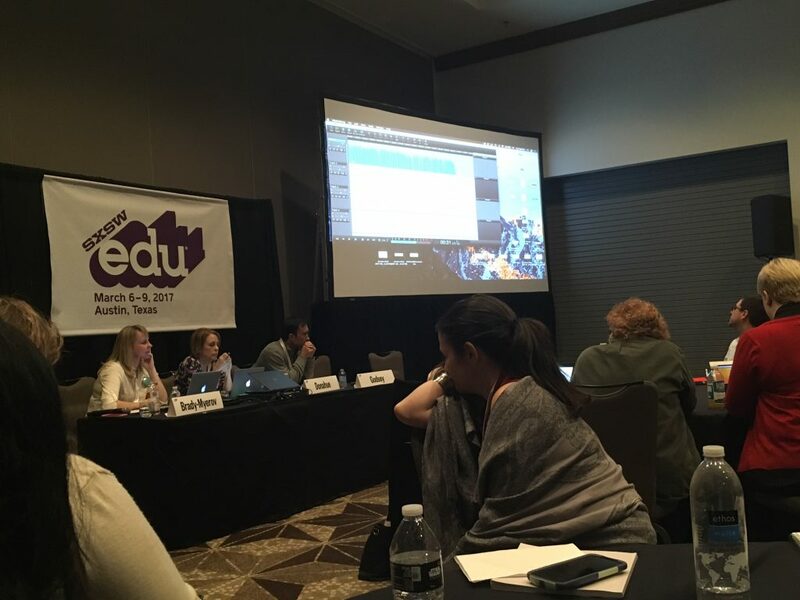 The goal was to show teachers how to teach students to make podcasts (read Michael Godsey’s blog recap here). 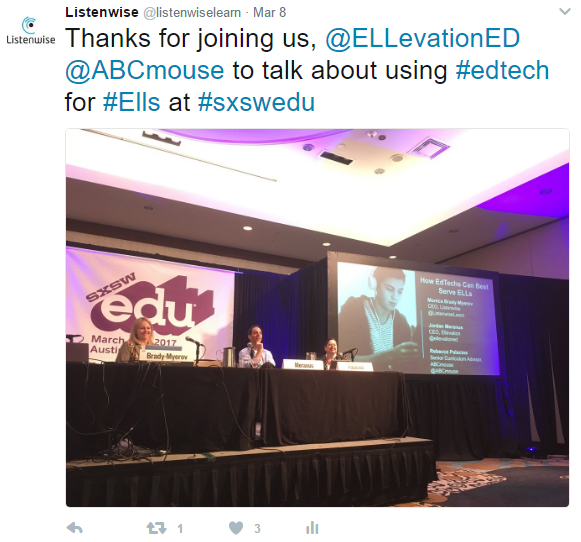 I also moderated a panel on wow ed-tech can help English-language learners, alsog with Jordan Meranus co-founder of Ellevation Education, and Rebecca Palacios of ABCmouse.com (read our Listenwise blog SXSWedu recap here). The prep time needed to work with our collaborators on the panels took up a lot of time before the conference. This was time I would typically be setting up networking meetings. People called me to set up meetings. Companies I had not worked with before, and contacts who I knew but had not worked with in a while, set up coffee meetings and lunch. My inbox was filled with party evites. I’m following up on those opportunities now. I have learned that the more work you put into networking, the more benefits you can reap. Monica Brady-Myerov is the founder and CEO of Listenwise, an education technology tool that brings the power of public radio into the classroom. Brady-Myerov was an award-winning public radio reporter for nearly 25 years. She is currently a blogger for The Startup Blog, where entrepreneurs chart their efforts to launch and build ed-tech companies and describe the challenges they face in securing funding, finding customers, and growing their businesses.